Do you think if it’s kept off (because there are no aftermarket covers as of now) the exposed bolts look bad? Yes and no. Once the bull bar if off, the plastic caps can be put back to cover up the bolt access area so not noticeable when looking from the front, BUT the top of the bumper will have holes from where the bull bar went into the bumper which can not be cloased off or covered. In addition, rain, snow etc will now enter the holes too. OTOH, with the G63's entirely different BB, once it is removed (in 5 minutes time), the stock OEM MB cover plates (same as used in the Euro 2019 G63's) will 100% cover the exposed opening in the front of the bumper slots. The MY2019 G63 uses an entirely different BB. Thankfully, it will not leave any exposed holes/openings on the TOP section of its bumper (e.g., the “top section,” meaning the part of the bumper that is parallel to the deck) when the G63 BB is removed and summarily ****kanned (or, unloaded on eBay!). 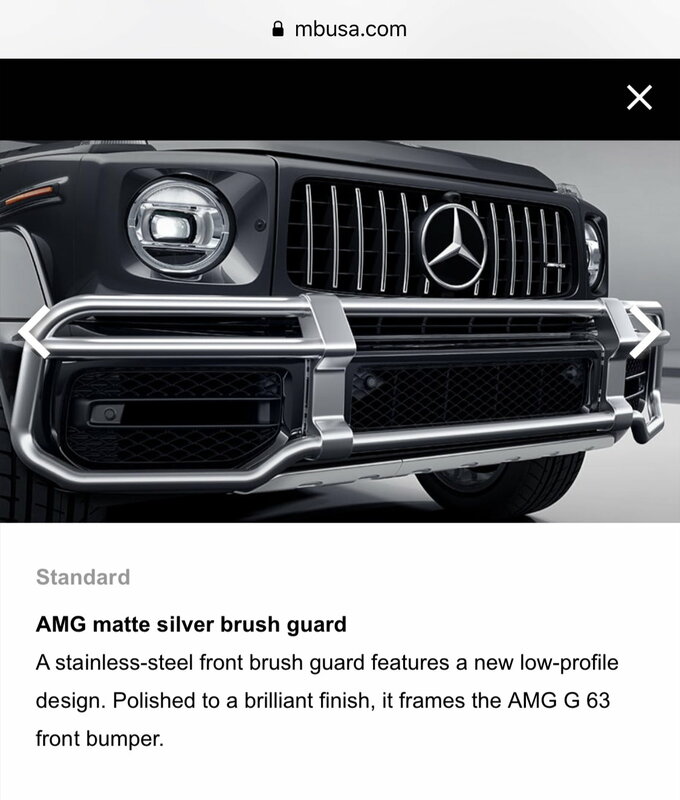 I plan to immediately remove the BB on my G63 Day 1 (hopefully via MB Service, if they are willing to do this in the first place, which I doubt), unless I get a MY2020 G63. In the latter case, who knows if MB will stick with the current (horrible) version(s) of the BB(s). IMHO, the 2019 BB's (both models) look like a Rube Goldberg last minute rush job (e.g., even blocking the non-existent camera on the 550, thus eliminating it. How stupid!) to get the cars out the door to the holding lots, with the first MY2019 G63’s rusting for up to 6 months “at the docks.” With any luck, perhaps MB will redesign the MY2020 BB, at least for the G63 (plus, implement MBUX!). Anyways, I plan to use the bumper's front face opening (without the cover plate) on the passenger side, so I can have a fabrication shop custom design, build/fabricate, and weld-up, a nice front mount for my Icom AH-740 HF antenna that will bolt into the female threads of the BB’s mounting point on the passenger side. I will then cover whatever is left, as necessary. This opening will be so perfect for what I'm trying to do with mounting an HF antenna on a G63. Probably the first HF application on a G63, outside of the G-Pro line, and military G's, of course. I think they make aftermarket covers to go over those holes, at least I'm hoping they come out soon. My wife likes her BB on her 2019 G550 white, but I'm going to remove mine on my 2019 G550 in Matte Black when it comes in. incorrect. All Gs have front camera in US and Canada. If you have a full bull bar in front it won’t work as vision is blocked. hmmm, well if hat’s the case then I’m missing the lens on my G550 because ours is all black plastic. Is there a setting that I need to check to turn it on? For US, only G63 has a camera as its BB is mounted well beneath the camera. You have a proximity sensor, and not a camera. That's what I had said in my previous comment but Eagles Nest seems to think I am incorrect so wanted to confirm that I don't have "defective Car". When I placed the order for both a G550 and G63, I was not able to order the 360 degree camera on the G550 as I could on the G63. My salesman said, they won't allow it so we got the G550 without it and my inbound G63 WILL have it as ordered. I appreciate you confirming me. In Canada both 360 camera and bull bar are listed as options on G550, but you can only pick one or the other. In a different thread, a person got a matte silver brush/bull bar? What's up with that? Is it an option? Thank you, exactly! They are mutually exclusive. In the US, the G550 bull bar is "required", therefore you don't get the 360 camera. Yes, the bull bar would obscure the view of the forward camera. I imagine this oversight will be rectified in the future. 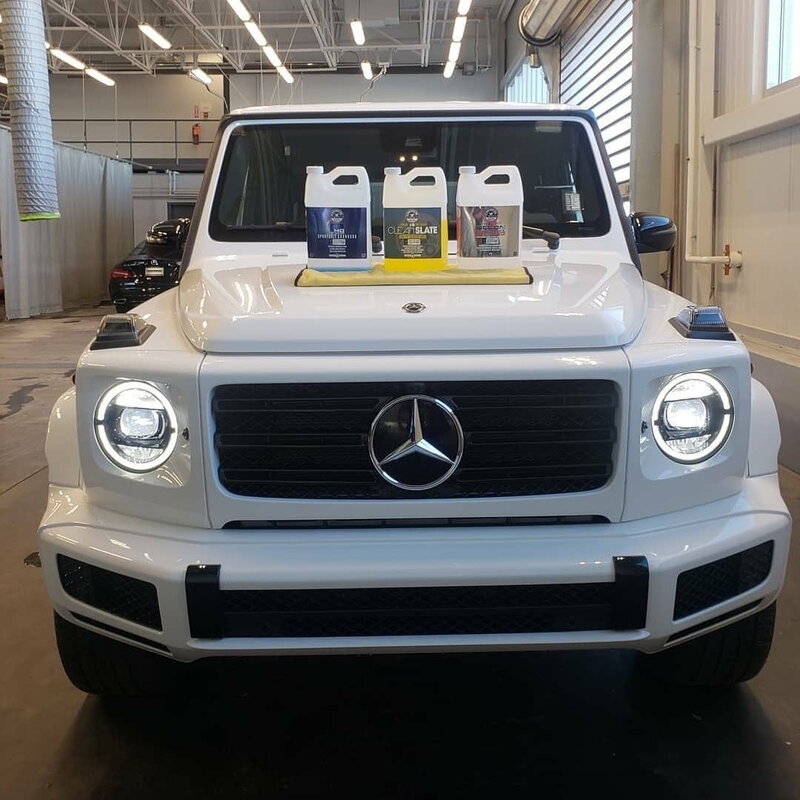 In the US, the matte silver is only available (and is standard) on the G63. Has anyone found a place that sells the plugs for the 2019 G550 in the event the front bull bar/ brush guard is removed? I've read on this forum (don't remember the thread) that you can request that the bull bar be deleted on your build? Does anyone know the build code for that? I didn't see it on the lastest G Class DOG. I'm not usually a "bump the thread" guy, but I haven't gotten a response so I thought I would ask again: I've read on this forum (don't remember the thread) that you can request that the bull bar be deleted on your build? Does anyone know the build code for that? I didn't see it on the lastest G Class DOG. My dealer is saying they have not heard of such a thing, yet people on this forum has said there is a "code" or a "delete option" available in the US. Can I get that info please? I want to delete my Bull Bar on my new 2019 G550. Thanks. I'm in the same boat, but with a G63 (ordered Oct 2018, expected in dealership about Nov/Dec 2019). I hate all of the BB's, and would pay the $1500 to have the stupid thing deleted! FWIW, I asked my dealer, and he said "Nope, not possible." I'm wondering if MB uses the same front bumper for G550s going to Canada and/or Europe. If so, then I got no problem unbolting the thing and ordering the covers from Europe. I like the chrome covers on the bumper (to match the ones on the back), so filling would not be what I would want. Are you sure that it is a different bumper? I think in Canada and Europe they use the same bumper but add covers (like your picture you attached). 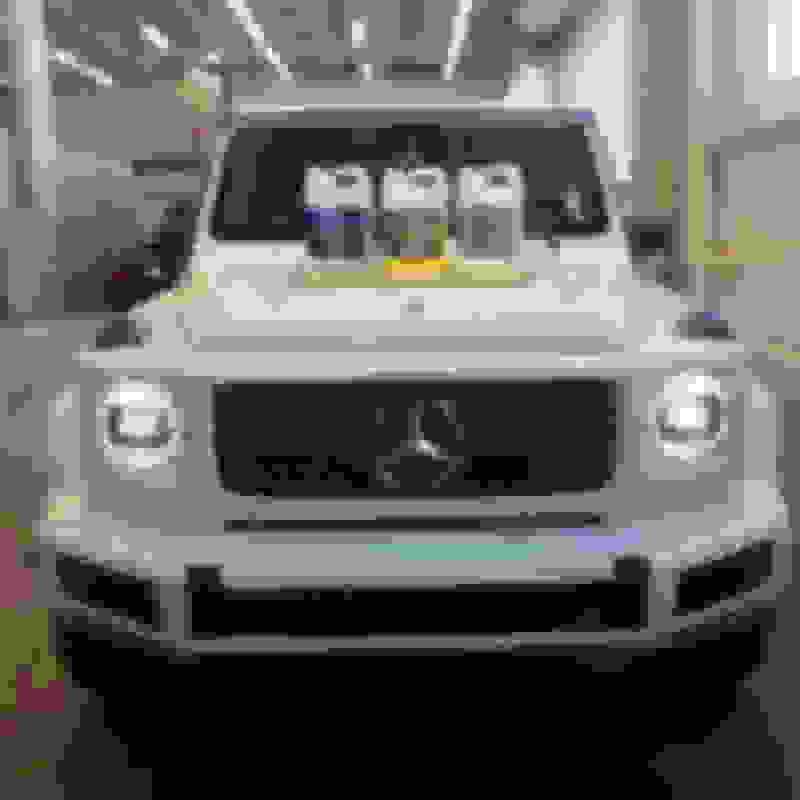 Is this a picture of a US Model 2019 Gwagen? Wow, looks sooooo much cooler sans BB! Sure wish MBUSA would wake up, and let their customers delete the darn BB!